Our Home Ed day in an Ebook! Many thanks to Fearless Homeschool for posting our Home Ed day! Which Arabic Resources do we use? Monday - Thursday the children have a private tutor in Egypt via Skype. They each have a half hour lesson with her in Tajweed/Arabic. This book is very easy to work through and the children prefer it over similar Qaidahs. Montessori is a system of education for young children that seeks to develop natural interests and activities rather than using formal teaching methods. How do I use Montessori at home? I use various Montessori play activities up to around the age of 5 or 6 or until I feel they are ready to progress to workbooks. I feel my children are benefiting from this way of learning as it develops confidence in their abilities and independence in their daily tasks. It helps to develop their motor coordination, fine motor skills and language skills. Where do I the resources? There are many different Montessori activities to buy online but I usually research activities through books and websites and then make them myself at home. They are then left out on the kitchen for the younger ones to explore whilst their older siblings get on with their own studies. Here are some we've been doing recently. Today the boys started a new topic 'Fractions' some of which they have covered before, but needed extra help with the equivalent fractions part. 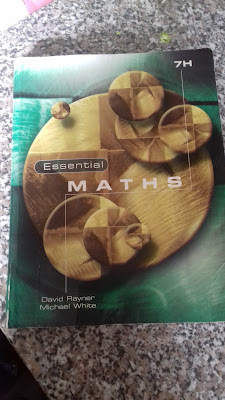 Here is the book we have been using. After explaining equivalent fractions they completed the exercises, they made their own memory game by cutting out 24 cards and each took a pair at a time and wrote equivalent fractions on them. Next they placed them upside down on the table and started their game. Each took it in turns to choose two cards and see if they were equivalents fractions, if they were then they kept the cards. The winner is the one with the most cards at the end. 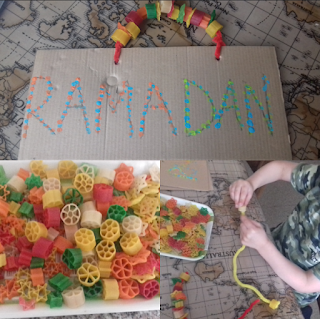 They also made this activity with wood, pins and elastic bands!!! After breakfast they had their Tajweed lessons online. M and AS sat at the table do start some crafts. AS is learning about frogs and the life cycle and M did some painting. It has been another rainy day so they each did their English, Maths & Science at the table until lunch. 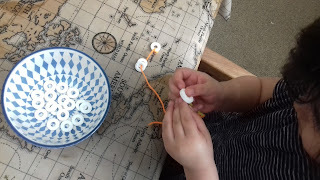 Along the way we include crafts, online work, experiments and any other practical activities I can think of to help them better understand the topic they are learning. The boys (A & AR) were learning Pie Charts in Maths so made a pie chart of their day and coloured them in. They worked together in English and planned a quest story. S was writing about the format of Media text which she continued from yesterday, revised Standard Form in Maths and revised Mixing and Dissolving substances in Chemistry. Here are some pics of the little extras of today. 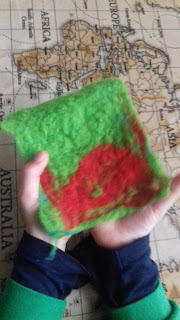 Abdur-Rahmaan looking at the felt he made at an Art Workshop. Abdus-Salaam making a spider catcher!